Greyfriars at 12 is a weekly Thursday lunchtime concert series in the Kirk sanctuary. 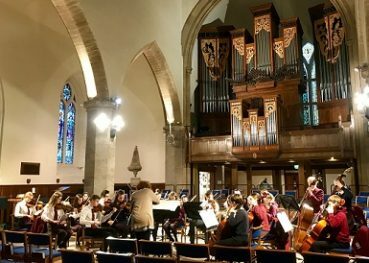 Concerts regularly host music students, recent graduates from Edinburgh University, the Royal Conservatoire of Scotland and Argyll String Quartet. Soloists and small ensembles have also performed at the Kirk; we are particularly keen that secondary school children are able to show off their talent. Touring ensembles, small orchestras and choirs are also welcome to perform, subject to availability (a fee for 6 adult performers or more is also charged to cover administrative and Kirk preparation costs). Interested in performing at Greyfriars at 12? Click here to learn more. Concerts are free to attend and donations are welcome. The latest Greyfriars at 12 concert schedule can be accessed by visiting our Events page.